Model of Fobos-Grunt spacecraft at the 2011 Paris Air Show. The spacecraft arrived at Baikonur Cosmodrome on 17 October 2011 and was transported to Site 31 for pre-launch processing. The Zenit-2SB41 rocket carrying Fobos-Grunt successfully lifted off from Baikonur Cosmodrome at 20:16 UTC on 8 November 2011. The Zenit booster inserted the spacecraft into an initial 207 km × 347 km (129 mi × 216 mi) elliptical low Earth orbit with an inclination of 51.4 degrees. On 22 November 2011, a signal from the probe was picked up by the European Space Agency's tracking station in Perth, Australia, after it had sent the probe the command to turn on one of its transmitters. The European Space Operations Centre (ESOC) in Darmstadt, Germany, reported that the contact was made at 20:25 UTC on 22 November 2011 after some modifications had been made to the 15 m dish facility in Perth to improve its chances of getting a signal. No telemetry was received in this communication. It remained unclear whether the communications link would have been sufficient to command the spacecraft to switch on its engines to take it on its intended trajectory toward Mars. Roscosmos officials said that the window of opportunity to salvage Fobos-Grunt would close in early December. The U.S. Strategic Command’s Joint Space Operations Center (JSpOC) tracked the probe and identified at the start of December that Fobos-Grunt had an elliptical orbit at an altitude of between 209 kilometres (130 mi) and 305 kilometres (190 mi), but falling a few miles each day. Before reentry, the spacecraft still carried about 7.51 metric tonnes of highly toxic hydrazine and nitrogen tetroxide on board. This was mostly fuel for the spacecraft's upper stage. These compounds, with melting points of 2 °C and −11.2 °C, are normally kept in liquid form and were expected to burn out during re-entry. NASA veteran James Oberg said the hydrazine and nitrogen tetroxide "could freeze before ultimately entering", thus contaminating the impact area. He also stated that if Fobos-Grunt is not salvaged, it may be the most dangerous object to fall from orbit. Meanwhile, the head of Roscosmos said the probability of parts reaching the Earth surface was "highly unlikely", and that the spacecraft, including the LIFE module and the Yinghuo-1 orbiter, would be destroyed during re-entry. In January 2012, scientists and engineers at the Russian Space Research Institute and NPO Lavochkin called for a repeat sample return mission called Fobos-Grunt-2 and Boomerang for launch in 2020. Popovkin declared that they would soon attempt to repeat the Fobos-Grunt mission, if an agreement was not reached for Russian co-operation in the European Space Agency's ExoMars program. However, since an agreement was reached for the inclusion of Russia as a full project partner, some instruments originally developed for Fobos-Grunt were flown in the ExoMars Trace Gas Orbiter. Phobos-Grunt around Mars: (1) Arrival of Phobos-Grunt, (2) Insertion maneuver in orbit around Mars, (3) Drop of the Fregat stage and separation of the probe and Yinghuo-1, (4) Maneuver for to raise the periapsis, (5) Yinghuo 1 starts his mission on the first orbit, (6) Maneuver to place himself in an orbit close to that of Phobos; (A) Orbit of Phobos, (B) Orbit of insertion of Phobos-Grunt and Yinghuo-1, (C) Orbit with raised periapsis, (D) Quasi-synchronous orbit with Phobos. The mission control center was located at the Center for Deep Space Communications (Национальный центр управления и испытаний космических средств (in Russian), Євпаторійський центр дальнього космічного зв'язку (in Ukrainian)) equipped with RT-70 radio telescope near Yevpatoria in Crimea, Ukraine. Russia and Ukraine agreed in late October 2010 that the European Space Operations Centre in Darmstadt, Germany, would have controlled the probe. ^ a b "Конструкция АМС "Фобос-Грунт"". galspace.spb.ru. Retrieved 1 July 2018. ^ a b c d e f Vítek, Antonín (25 January 2012). "2011-065A - Fobos-Grunt". Space 40 (in Czech). Retrieved 9 September 2018. ^ Jonathan Amos (9 November 2011). "Phobos-Grunt Mars probe loses its way just after launch". BBC. ^ a b Molczan, Ted (9 November 2011). "Phobos-Grunt – serious problem reported". SeeSat-L. Retrieved 9 November 2011. ^ a b "Russian space probe crashes into Pacific Ocean". Fox News Channel. 15 January 2012. ^ "Jonathan's Space Report No. 650 2011 Nov 16". Archived from the original on 9 September 2012. ^ a b c "Daring Russian Sample Return mission to Martian Moon Phobos aims for November Liftoff". Universe Today. 13 October 2011. ^ "NASA Spacecraft Returns With Comet Samples After 2.9 Bln Miles". Bloomberg L.P. 15 January 2006. Retrieved 4 March 2008. ^ a b c Zaitsev, Yury (14 July 2008). "Russia to study Martian moons once again". RIA Novosti. ^ a b c Zak, Anatoly. "Preparing for flight". Russianspaceweb.com. Retrieved 26 May 2009. ^ "Russia takes aim at Phobos". Nature. 4 November 2011. ^ a b "Mars Moon Lander to Return Russia to Deep Space". The Moscow Times. 8 November 2011. ^ a b Harvey, Brian (2007). "Resurgent – the new projects". The Rebirth of the Russian Space Program (1st ed.). Germany: Springer. pp. 326–330. ISBN 978-0-387-71354-0. ^ "Russia to test unmanned lander for Mars moon mission". RIA Novosti. 9 September 2010. ^ "China to launch probe to Mars with Russian help in 2009". RIA Novosti. 5 December 2008. ^ a b c d e Mike Wall (14 November 2011). "Russia Still Trying to Contact Stranded Mars Moon Probe". Space.com. Retrieved 20 May 2012. ^ a b c "Phobos-Grunt". European Space Agency. 25 October 2004. Retrieved 26 May 2009. ^ Bergin, Chris (21 May 2007). "With a Russian hitch-hike, China heading to Mars". NASAspaceflight. ^ "China and Russia join hands to explore Mars". People's Daily. 30 May 2007. Retrieved 31 May 2007. ^ Zhao, Huanxin (27 March 2007). "Chinese satellite to orbit Mars in 2009". China Daily. ^ "HK triumphs with out of this world invention". HK Trader. 1 May 2007. ^ "Projects: LIFE Experiment: Phobos". The Planetary Society. Archived from the original on 16 March 2011. Retrieved 2 April 2011. ^ "Living interplanetary flight experiment (LIFE): An experiment on the survivalability of microorganisms during interplanetary travel" (PDF). Retrieved 1 July 2018. ^ Zak, Anatoly (1 September 2008). "Mission Possible". Air & Space Magazine. Smithsonian Institution. Retrieved 26 May 2009. ^ a b Zak, Anatoly (1 September 2008). "Mission Possible – A new probe to a Martian moon may win back respect for Russia's unmanned space program". AirSpaceMag.com. Retrieved 26 May 2009. ^ "LIFE Experiment: Phobos". The Planetary Society. ^ "Проект "Люлин-Фобос" – "Радиационно сондиране по трасето Земя-Марс в рамките на проекта "Фобос-грунт"". Международен проект по програмата за академичен обмен между ИКСИ-БАН и ИМПБ при АН на Русия – (2011–2015)". Bulgarian Academy of Sciences. ^ "MetNet Mars Precursor Mission". Finnish Meteorological Institute. Archived from the original on 19 October 2010. ^ "Space technology – a forerunner in Finnish-Russian high-tech cooperation". Energy & Enviro Finland. 17 October 2007. Archived from the original on 17 March 2009. ^ "Fobos-Grunt probe launch is postponed to 2011" (in Russian). RIA Novosti. 21 September 2009. Retrieved 21 September 2009. ^ "Russia delays Mars probe launch until 2011: report". Space Daily. 16 September 2009. ^ Zak, Anatoly (April 2009). "Russia to Delay Martian Moon Mission". IEEE Spectrum. Retrieved 26 May 2009. ^ "Industry Insiders Foresaw Delay of Russia's Phobos-Grunt". Space News. 5 October 2009. ^ a b "Difficult rebirth for Russian space science". BBC News. 29 June 2010. ^ "Phobos-Grunt project in 2011". russianspaceweb.com. Retrieved 1 July 2018. ^ "Russia launches probe to Mars moon". RIA Novosti. 9 November 2011. ^ "We need your support in the project "Phobos-Soil"". Russian Space Research Institute. 2011. Archived from the original on 24 August 2014. Retrieved 22 April 2012. ^ "Phobos-Grunt to be launched to Mars on Nov 8". Interfax News. 4 October 2011. Retrieved 5 October 2011. ^ "Fobos-Grunt space probe is moved to a refueling station" (in Russian). Roscosmos. 21 October 2011. Archived from the original on 2 April 2012. Retrieved 21 October 2011. ^ "Timeline for the Phobos Sample Return Mission (Phobos Grunt)". Planetary Society. 27 October 2010. Archived from the original on 28 November 2010. Retrieved 28 October 2010. ^ Роскосмос признал, что шансов реализовать миссию "Фобос-Грунт" практически не осталось (in Russian). ^ Amos, Jonathan (23 November 2011). "Signal picked from Russia's stranded Mars probe". BBC News. ^ a b c d Clark, Stephen (23 November 2011). "It's alive! Russia's Phobos-Grunt probe phones home". Spaceflight Now. ^ a b Peter B. de Selding (23 November 2011). "ESA Makes Contact with Russia's Stranded Phobos-Grunt Spacecraft". Space News. Retrieved 20 May 2012. ^ "ESA receives telemetry from Russian Mars probe". RIA Novosti. 24 November 2011. ^ a b "Russia's Mars probe starts making regular contact". MSN News. 23 November 2011. Retrieved 20 May 2012. ^ a b Denise Chow (2 December 2011). "Is Phobos-Grunt dead? Europeans end rescue effort". MSNBC News. Retrieved 20 May 2012. ^ Denise Chow (2 December 2011). "Is Phobos-Grunt Dead? Troubled Russian Probe Still Unresponsive". MSNBC News. Retrieved 20 May 2012. ^ a b "Space agency postpones Phobos contact until Monday". RIA Novosti. 25 November 2011. Retrieved 20 May 2012. ^ Leonard David (22 November 2011). "Time Running Out to Save Russian Mars Moon Probe". Retrieved 14 May 2012. ^ Genalyn Corocoto (30 November 2011). "Phobos-Grunt: ESA's Latest Orbit Raising Maneuvers Fail, Re-entry Expected in January". International Business Times. Archived from the original on 1 July 2012. Retrieved 20 May 2012. ^ Leonard David (6 December 2011). "Russia's Mars Probe Appears 'Dead in the Water'". Retrieved 12 May 2012. ^ "Data beamed from Russia Mars probe 'deciphered'". RIA Novosti. 24 November 2011. Retrieved 20 May 2012. ^ Michael Listner (14 November 2011). "Phobos-Grunt: a legal analysis of potential liability and options for mitigation". The Space Review. Retrieved 20 May 2012. ^ "Most Popular E-mail Newsletter". USA Today. 1 December 2011. ^ Enoch, Nick (16 January 2012). "Maybe Brazil... or possibly off the coast of Chile? Russian officials admit having no idea where failed Mars probe has crashed". Daily Mail. London. Retrieved 16 January 2012. ^ "Ballistics confirmed the coordinates of the fall of the "Phobos-Grunt" (Google Translate from Russian: Баллистики подтвердили координаты точки падения "Фобос-Грунта")". RIA Novosti. 16 January 2012. Retrieved 16 January 2012. ^ Sanderson, Katharine (18 January 2012). "Phobos-Grunt Crashes Into the Pacific". Astrobiology Magazine. Retrieved 28 March 2012. ^ Bloomberg (17 January 2011). "Oops! Radar may have caused space crash". Sidney Morning Herald. Retrieved 20 May 2012. ^ Oberg, James (16 February 2012). "Did Bad Memory Chips Down Russia's Mars Probe?". IEEE Spectrum. Retrieved 30 March 2012. ^ Vergano, Dan (8 January 2012). "Underfunding doomed Russian Mars probe, lawyer says". USA TODAY. Retrieved 23 March 2012. ^ de Carbonnel, Alissa (31 January 2012). "Russia blames Mars probe failure on space radiation". Reuters. Retrieved 27 February 2012. ^ "Russia Places Phobos-Grunt Failure Blame". Retrieved 1 July 2018. ^ Clark, Stephen (6 February 2012). "Russia: Computer crash doomed Phobos-Grunt". Spaceflight Now. Retrieved 29 February 2012. ^ "Programmers are to be blamed for the failure of Phobos mission". ITAR-TASS News Agency. 31 January 2012. Retrieved 29 February 2012. ^ "Phobos-Grunt project in 2011". www.russianspaceweb.com. Retrieved 1 July 2018. ^ Louis D. Friedman (6 February 2012). "Phobos-Grunt Failure Report Released". The Planetary Society. Retrieved 20 May 2012. ^ Merryl Azriel (21 January 2011). "Grief and Concern over Russian Phobos-Grunt Failure". Space Safety Magazine. Retrieved 20 May 2012. ^ Eric Hand (28 November 2011). "Medvedev: Punishment awaits those behind Russian Mars failure". Nature. Retrieved 20 May 2012. ^ "Medvedev suggests prosecution for Russia space failure". Reuters. 26 November 2011. ^ Olga, Zakutnyaya (2 February 2012). "Russia's Ambitious space projects: Phobos-Grunt-2?". Russian and India Report. Retrieved 1 April 2012. ^ Lev, Zelenyi,; Maxim, Martynov,; Alexander, Zakharov,; Oleg, Korablev,; Alexey, Ivanov,; George, Karabadzak, (1 July 2018). "Phobos Sample Return: Next Approach". 40. Retrieved 1 July 2018. ^ Russia to make another attempt to bring back Mars moon material. 16 October 2013. ^ ""Phobos-Grunt-2" can be launched in 2020, says the head of IKI". RIA Novosti. 25 April 2012. Retrieved 29 April 2012. ^ "Federal Space Agency accepted the offer to renew the RAS Project "Phobos-Grunt"" (in Russian). Interfax.ru. 10 April 2012. Retrieved 15 April 2012. ^ "Russia May Run Repeat Mission to Phobos". RIA Novosti. 31 January 2012. Retrieved 11 February 2012. ^ Jonathan Amos (15 March 2012). "Europe still keen on Mars missions". BBC News. Retrieved 16 March 2012. ^ "Federal Space Agency is going to repeat the project "Phobos-Grunt"". RBC. 19 April 2012. Archived from the original on 10 May 2013. Retrieved 20 April 2012. ^ "Russia to focus on Moon, Mars exploration, repeat Phobos-Grunt mission". ITAR - TASS. Moscow. 2 August 2014. Retrieved 3 August 2014. 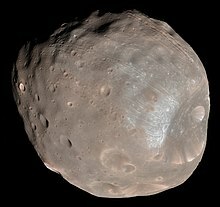 ^ "Russia May Send Repeat Mission to Martian Moon Phobos in 2023". RIA Novosti. Moscow. 3 October 2014. Retrieved 5 October 2014. ^ a b "ESA at MAKS 2015". European Space Agency. Zhukovsky, Russia: ESA. Retrieved 22 December 2015. ^ Kane, Van (9 June 2014). "A Checkup on Future Mars Missions". The Planetary Society. Retrieved 22 December 2015. ^ a b Fobos-Grunt 2: "Choosing the launch window." 8 October 2015. Accessed on 29 December 2015. ^ Ilya Kramnik (18 April 2012). "Russia takes a two-pronged approach to space exploration". Russia & India Report. Retrieved 18 April 2012. ^ Dwayne A. Day (28 November 2011). "Red Planet blues". The Space Review. Retrieved 18 April 2012. ^ "Russia joins EU-led ExoMars expedition to Red Planet". Russia Today. 14 March 2013. Retrieved 14 March 2013. ^ Korablev, O. "Russian programme for deep space exploration" (PDF). Space Research Institute (IKI). p. 14. ^ "Living Interplanetary Flight Experiment (LIFE)". The Planetary Society. Archived from the original on 20 January 2011. ^ "Optico-electronic Instruments for the Phobos-Grunt Mission". Space Research Institute of the Russian Academy of Sciences. Retrieved 20 July 2009. ^ a b c d e f g h Harvey, Brian (2007). "Resurgent – the new projects". The Rebirth of the Russian Space Program (1st ed.). Germany: Springer. ISBN 978-0-387-71354-0. ^ "Optical Solar Sensor". Space Research Institute of the Russian Academy of Sciences. Retrieved 20 July 2009. ^ "Конструкция АМС "Фобос-Грунт"". galspace.spb.ru. Retrieved 1 July 2018. ^ a b c d "Russia resumes missions to outer space: what is after Phobos?" (in Russian). ^ a b "COSPAR Planetary Protection Policy". ^ "Phobos Flyby Images: Proposed Landing Sites for the Forthcoming Phobos-Grunt Mission". Science Daily. 15 March 2010. Archived from the original on 7 November 2011. Retrieved 7 November 2011. ^ a b c d Zak. "Mission Possible". ^ "Russia's Phobos Grunt to head for Mars on November 9". Itar Tass. 25 October 2011. Retrieved 27 October 2011. ^ DiGregorio, Barry E. (28 December 2010). "Don't send bugs to Mars". New Scientist. Retrieved 8 January 2011. ^ McLean, R; Welsh, A; Casasanto, V (2006). "Microbial survival in space shuttle crash". Icarus. 181 (1): 323–325. Bibcode:2006Icar..181..323M. doi:10.1016/j.icarus.2005.12.002. PMC 3144675. PMID 21804644. Wikimedia Commons has media related to Phobos-Grunt.